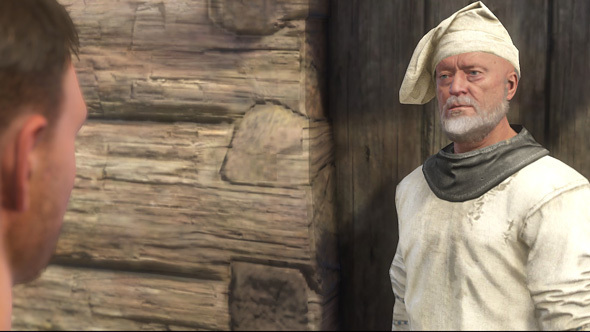 Life was tough in 15th century Bohemia, and Kingdom Come: Deliverance captures it in all its glory, or lack thereof. This is not an easy game: it has an awkward saving system, survival elements that swallow you whole, and it can take blood, sweat, and tears to make just even a single penny. Looking to brawl? 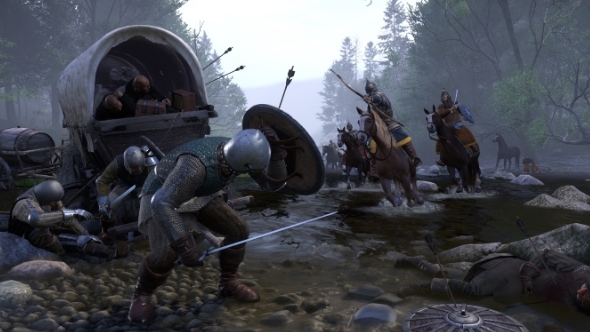 Our Kingdom Come: Deliverance combat guide can help. But fret not, for we are here to deliver you from failure, to help you find your feet during those gruelling early hours of the game. Here is our guide to what’s what in the cruel, wonderful world of Kingdom Come. 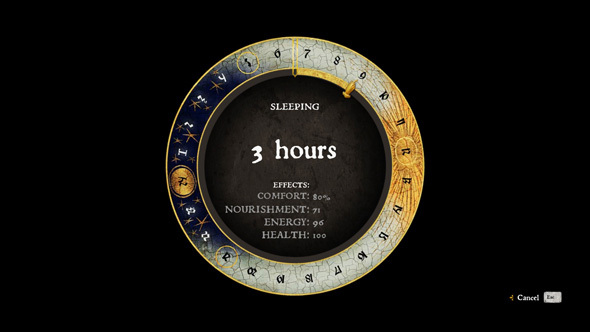 The early hours of Kingdom Come are particularly tough, which might leave you wondering why you should continue playing as your stomach shrivels and you get weary from exhaustion. But don’t worry, the game doesn’t stay this difficult forever. Here’s what you need to know to power through Henry’s early days. At the start of quests (and at key points during quests). You can save your game when beginning of a quest. But you can also save at certain points in the middle of a quest, usually after completing a sub-objective. But do not rely on this, so if it’s a multi-part quest be wary that the game might not save until it is fully finished. Sleep in your own bed, a bed you rent in lodgings, or at a vacant campsite. This should work whether you sleep for one hour or eight. However, many players have encountered a bug where sleeping doesn’t save the game. There’s not much you can do about this except wait for a patch, or just hope it goes away. Use a bathhouse. You can save your game with even the cheapest bathhouse treatment, and you come out with some nice clean garments too! Drink Saviour Schnapps. This beverage lets you save from the menu, and can be found at most taverns. It’s pretty pricey though (around 100 Groschen), which doesn’t make it that viable in the early game. Alternatively, you can craft it using wine, a handful of nettles, and two handfuls of Belladonna (deadly nightshade) Also, you can only carry three of them so, y’know, good luck with that. Honesty really doesn’t pay in this game, but if you want to try to play through Kingdom Come with no criminal record and a clean conscience, more power to you. For the rest of you, it’s very easy to make plenty of money early in the game. The answer, is theft, obviously, and the best place to do it early on is in Talmberg. Sneak into the armoury there with a lockpick or two, and there’s a ‘Very Easy’ chest that you can break into with plenty of goodies in it. That’s not all. Near both entrances to the armoury, there are guards on patrol, and they are usually alone. When they move close to the armoury (one of them even goes inside), knock them out, drag them inside, and rob them naked. They’ve got over 1000 Groschen of equipment on each of them that you can sell on to Peshek at a good price. Most food – unless it is dried – does not last very long. Meat, cheeses, and mushrooms all expire quickly, and once they get below 50% freshness (displayed in the inventory), you will get food poisoning if you eat them – even an apple at 49% freshness poisons you slightly. The stat debuff is quite minor when the food is just a bit off, but if food is really bad then you are looking at a lengthy period of depleting health too, which can kill you. You will know you are poisoned by the skull icon that appears next to your health bar. You can get rid of food poisoning by sleeping it off. While Kingdom Come is strict about trespassing and theft, it seems everyone is fine for you to stick your unwashed hands into their cauldron of… goulash? Stew? Baked beans? No-one really knows what it is, but It doesn’t matter. These bubbling cauldrons of red goop are found in houses, camps, and taverns throughout the world, and are very nourishing. You can only take one swig, but each pot replenishes after a day or so. Hunting is a great source of food, as each killed animal contains about ten portions of its respective meat. It is unlikely that you will get through it all before it goes off but you can always sell the leftovers (expiring meat goes down well in Bohemia). Remember to cook the meat, too. 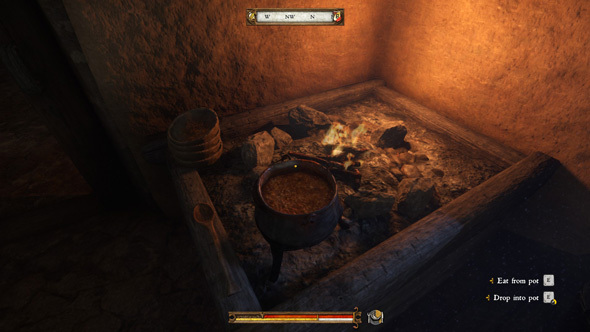 You can’t start fires in Kingdom Come but you can use existing ones, including those with cooking pots already hanging over them. Healing isn’t just a case of sticking on a bandage on a wound or chowing down on some cooked chicken – although, bandages do stop bleeding, and eating food restores tiny amounts of health alongside nourishing you. 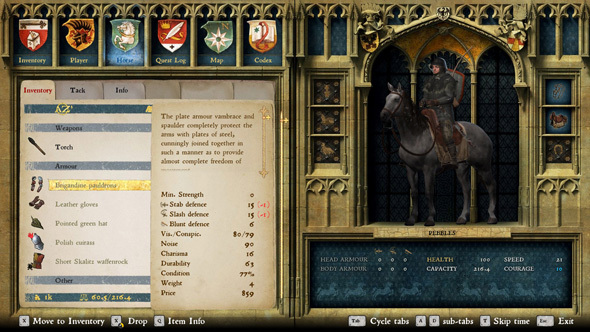 The closest thing to a healing potion in Kingdom Come is the Marigold Concoction, which you can buy yourself or craft using Belladonna and Herb Paris. This gradually restores health for a short period of time. However, as with bandages and food, you can’t use this mid-battle. So, no, there is no way to patch up during a fight. Sleep is the best way to restore bulk amounts of health. You are supposed do this in beds you are allowed to sleep in, but I have found that during the day, when people are out working, you can easily sneak into houses and get a bit of shut-eye without getting caught – remember that this won’t save the game, and make sure you are done by dusk, when people start to come home. Let’s assume, without judgement, that you will be pilfering every sword, shoe, and pretzel you find – you will need a contact to foist those goods onto. To do this, repay your debt to Miller Peshek, the owner of the mill outside Ratay where you are staying after the prologue. Once you have repaid him (either by cash or by quest), he gets unlocked as a trader who you can sell illicit goods to. Alternatively, you can sell stolen goods to ordinary traders if they are far enough away from where you committed the theft. As with many RPGs, weight is an issue in Kingdom Come, but not as much as you might think given its adherence to realism. You can unlock perks like Mule 1 and Mule 2 at Strength levels 4 and 8 to help you out, but much more useful is an actual mule. 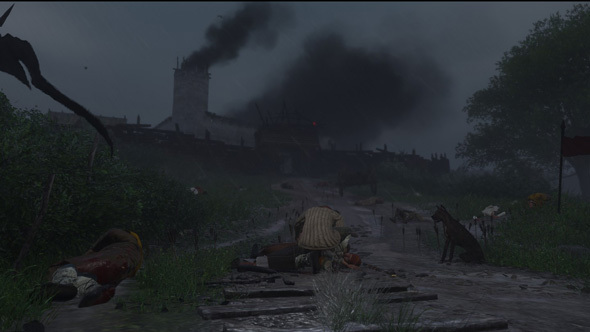 You get your first horse in Rattay at the start of the story quest The Hunt Begins. This effectively triples your inventory capacity, allowing you to shift goods between yourself and your horse even if it isn’t nearby. As a ridiculous example, I grabbed a suit of plate armour off my horse during the rooftop boss showdown against Runt. If carry capacity means a lot to you, go for the Heavy Duty Pony perk too, which increases its carry capacity at the cost of speed. Those horses are plenty fast anyway.